I mentioned this book in my Friday Four last week and got to thinking about it again. And the more I thought about it, the more I wanted to re-read it and the more I wanted my friends to read it so I'd have people to discuss it with. So I'm doing my first "dusting off" post in a year or so, hoping to inspire some of you to pick it up and accept the challenge to your assumptions. 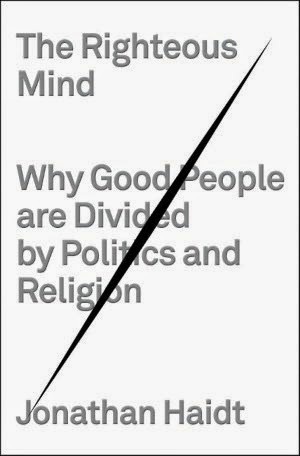 Jonathan Haidt's look at the psychology of why politics and religion are so divisive - and getting more so - is fascinating. For all of our vaunted reasoning powers as human beings, we actually are more accurately described as creatures of intuition. Dr. Haidt outlines dozens of studies that have shown that our initial "gut" reaction comes first and then our reason works to find justifications for our reaction. Linking this to politics, he says that "part of what it means to be a partisan is that you have acquired the right set of intuitive reactions to hundreds of words and phrases" such as "taxes," "welfare," or "pro-life." In fact, due to the hits of dopamine the brain gets when one feels justified or apparent contradictions are resolved, Dr. Haidt states that "extreme partisanship may be literally addictive." Dr. Haidt uses dozens of effective analogies in his book which help the reader to understand how our brains work - the main one compares our intuition to an elephant and our reason to the elephant's rider. I like this one: "Our moral thinking is much more like a politician searching for votes than a scientist searching for truth." Confirmation bias - "the tendency to seek out and interpret new evidence in ways that confirm what you already think" - figures heavily into this theme. "People are quite good at challenging statements made by other people, but if it's your belief, then it's your possession--your child, almost-- and you want to protect it, not challenge it and risk losing it." I'd never heard the term WEIRD - referring to cultures that are "Western, educated, industrialized, rich, democratic" - but I appreciate him pointing out that WEIRD people are statistical outliers. "They are the least typical, least representative people you could study if you want to make generalizations about human nature." And, of course, Americans are more extreme outliers than Europeans, and the educated upper middle class in the US is "the most unusual of all." He sums up the greatest peculiarity of WEIRD culture in this sentence: "The WEIRDer you are, the more you see a world full of separate objects, rather than relationships." The Six Moral Foundations was eye-opening to me as a way to differentiate between those of a "liberal" mind-set versus a "conservative" mind-set. Whereas "liberals" generally put greatest emphasis on Care (lack of harm), Fairness (in the sense of equality rather than proportionality), and Liberty (versus oppression), "conservatives" define Fairness differently (in the sense of proportionality more than equality), put less emphasis on Care, and add the moralities of Loyalty, Authority, and Sanctity. My summary here doesn't do it justice, of course. I highly recommend you pick up the book yourself. I appreciate Dr. Haidt's summations of each chapter. It's easy to lose track when so much new information is thrown at you at once, and his concluding section in each chapter is very useful in keeping the most salient points in mind. He ends the book with two valid points he feels liberals have that conservatives should pay more attention to, and two valid counterpoints conservatives have that liberals would do well to heed. * You can't help the bees by destroying the hive. In other words, both sides have important contributions to make and neither is all right or all wrong. We need to listen better, recognize when our "elephant" is in charge, and determine to seek common ground.